Shrimp Scampi Recipe – Gluten Free Option Too! Looking for a recipe that is delicious, easy to make but can be served for a special occasion like Valentine’s Day, birthdays and more! Say hello to our Shrimp Scampi recipe. It’s what I’ll be making for my family for our Valentine’s dinner, I will actually be making it with shrimp and one with chicken as my daughter so far hasn’t developed the taste for enough seafood yet. I’m hoping she will eventually get there but in the meantime this recipe whether it’s with chicken or shrimp is divine in my opinion. When you switch out the pasta for my personal favorite brown rice past it becomes gluten-free too, bam just like that. What do you think, doesn’t that look yummy? I can’t wait to have it again, I might not be able to wait until Valentine’s Day. Speaking of Valentine’s Day make sure to check out our other Valentine’s Day themed recipes that really are good for any time of the year. We’re just saying Valentine’s Day right now because that’s what’s coming up and what I’m going to make next week LOL. Here’s one to start how about our Caramel Mocha which can be a Caramel Hot Chocolate for the kids, after all we don’t need kids on caffeine do we? Check it out HERE. 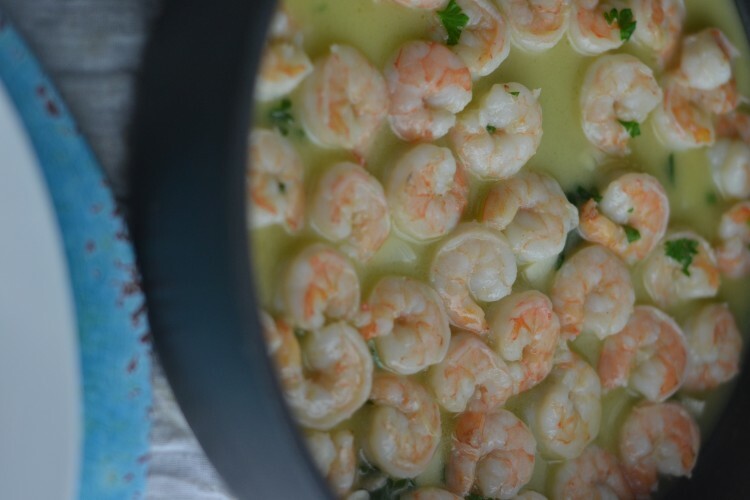 Now on to this Shrimp Scampi that can be done with chicken and can be gluten-free too recipe. Whew that was a mouthful. Also if you like the recipe make sure to click where it says yum below just before the picture! Cook pasta according to package and set aside. In a skillet melt butter and add in finely chopped garlic. Let cook over a medium heat for 1-2 minutes do not let butter burn. Add in your wine and juice from half a lemon. Add in your shrimp and cook on a medium-low heat for 10 minutes or until shrimp is pink. Pour over your pasta and garnish with parsley and romano cheese. Substitute Shrimp for Chicken Breasts – About 2-3 depending on how much you want. I told you it would be easy and yet you get a yummy meal that has options for any picky eaters you might have in the family. Trust me I’m an expert on picky eaters having a daughter who is one so I’m always looking into how I can modify a recipe without too much work. I of course love this shrimp scampi as is as I’m a seafood lover I admit it, I can’t get enough! If you try it tell us how you like it we’d love to hear from you! I love Shrimp Scampi. I prefer angel hair pasta and occasionally use roasted garlic. I love Shrimp Scampi! I’m keeping this recipe. It’s been a while since I’ve had Shrimp Scampi, never made it at home before. Thanks for the recipe. I could live on shrimp, and while I don’t have issues with gluten, other family members sometimes do. Thanks for the gluten-free version of one of my favorite dishes. i always order shrimp scampi when we go out to eat for special occasions. About time I try to make it at home. thanks for the recipe. I love shrimp scampi and I must try this recipe. I think I would use the rice noodles for that.I am not a fan of the NAME BRAND version of gluten free pasta. I like shrimp, but not so much prepared this way. I like it either plain, or breaded with cocktail sauce. I’m a picky eater. I’m sure that I’m missing out on several great dishes because of it.